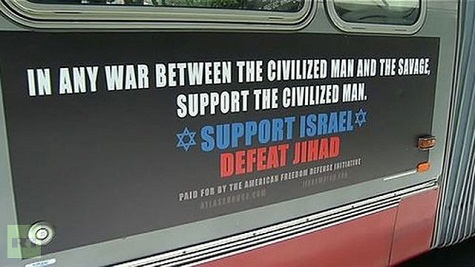 Home > Uncategorized > Islamophobic NY subway ad improved! My rant about the Islamophobic NY subway ads went viral and got 3,000 hits in one day. Since there is no way in hell that the 9/11-complicit mobbed-up Zionist courts in New York are going to allow comparable anti-Jewish ads equal time with the anti-Muslim ads, this is a violation of the First Amendment’s decree that all religions must be treated equally. When unconstitutional acts occur, extreme measures are called for. 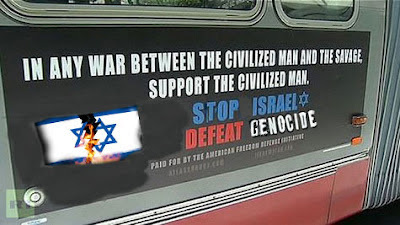 Blowing up the NY subway system and/or killing everyone responsible for putting up the Islamophobic ads (which is what the terrorist Jewish Defense League would do if comparable anti-Jewish ads went up) would be going too far. Instead, let’s “improve” the ads.